The GretagMacbeth Spectrolino® is a spectrometer. 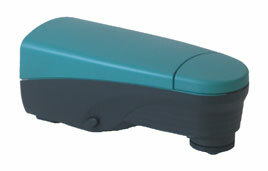 The Spectrolino® is a handheld spectrometer which measures from 380 to 730 nm, inclusive. Spectral data is reported at 10 nm intervals. It is accompanied by a kit of accessories which include a CRT attachment, a spot metering tool, and filters for polarization, D65, and a null filter. An optional UV Cut filter is also available. It uses a tungsten-halogen bulb for illuminating reflective specimens. This instrument is connected to a host computer with an RS-232 serial connection. Spectrometer filters allow the adaption of the Spectrolino for a variety of measuring situations. The Null filter is used for most reflective and emissive measurements. The D65 filter changes the spectral output of the tungsten-halogen to more closely match that of CIE Illuminant D65. The UV Cut filter is used to remove the small amount of ultraviolet light present in the tungsten-halogen illumination so that papers with fluorescent whitening agents will not have these agents effecting the spectral measurements. SpectroScan®, a table which allows the Spectrolino® to measure printed charts automatically. SpectroScan T®, an automated measurement table for the Spectrolino® which has an additional area for measuring transparencies. This instrument is no longer being manufactured.